Even if you’re a carnivore, sometimes you want to eat something lighter that’s still packed with flavor. When it’s hot out, for example, we sometimes are temporary vegetarians. It goes without saying that this dish is also perfect for real vegetarians. 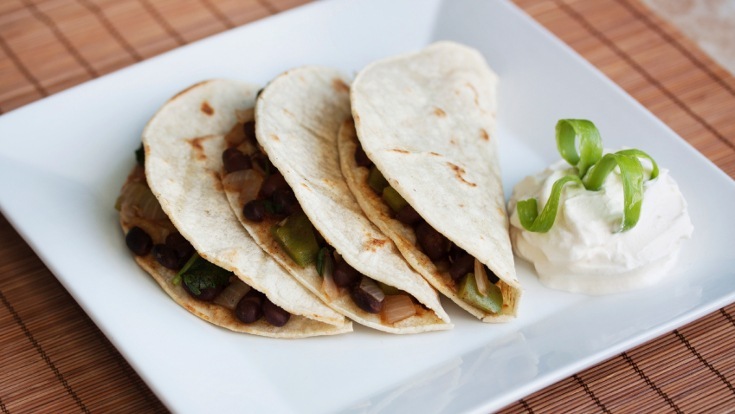 Who doesn’t love black bean tacos? Combine the beans, tomatoes, onions, parsley, zest, lime juice, and peppers in a bowl and sprinkle with garlic salt. Stir gently but well to coat all ingredients with the lime juice. It can be used immediately or for a more intense flavor, cover and refrigerate the mixture for 3 or more hours. When you’re read to serve it, combine the chopped spinach and romaine. Place a small handful of the lettuce mixture into a corn tortilla. Place a teaspoon of yogurt on top of the lettuce and spread it to cover the lettuce mixture. Add a scoop of the drained tomato/bean mixture on top of the lettuce. Add another small handful of lettuce to the taco and finish with another dollop of yogurt. Fold each tortilla into a roll and secure with toothpicks if necessary. Serve immediately. There’s no cooking involved in this lovely dish, only mixing! Can you believe it? Looking to make lunch in 5 minutes flat? This is your go-to recipe. Enjoy!